When it comes to digital advertising for the travel industry, it’s clear Sojern has its competitors beat. The Omaha-based company, which was founded 11 years ago by Gordon Whitten ’93, currently serves more than 90 percent of the Fortune 500 travel companies. The company employs about 500 people across 13 global offices, and for the last five years, it has been honored on the Deloitte Technology Top 500 Fastest Growing Companies list. 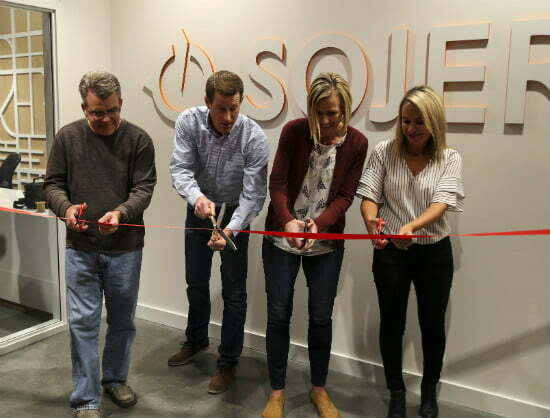 Brent Brummer ’04 (second from left) cutting the ribbon in August at Sojern’s new headquarters. 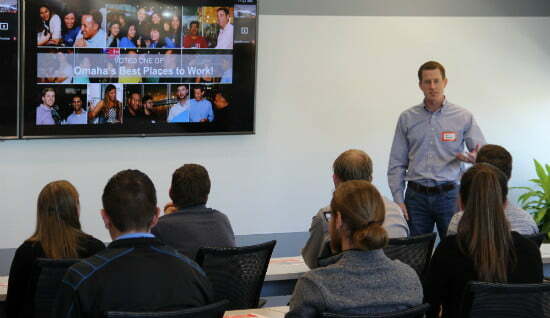 “Our secret to growing quickly and effectively is to hire strong leaders and employees in new markets, train them on our products and processes and then let them run fast,” said Brent Brummer ‘04, vice president of business and strategy and member of the Hastings College Foundation Board of Trustees. Brummer has been with Sojern since its inception. He’s watched the company grow from 20 employees who focused on helping travel companies put their advertisements on boarding passes, to an internationally successful influencer of where and how people book their trips. In August, Brummer led the company in opening its newest workspace — in the same place it all started. Situated in the West Dodge corridor of Omaha, Sojern’s new building combines two previously separate offices into one. It expands the physical footprint of the workspace by 40,000 square feet, complete with 190 workstations, 53 conference rooms, a kitchen, three mothers’ rooms, two ping pong tables, one shuffleboard table and an on-site gym. The building was designed to accommodate 325 employees. Brummer said Sojern’s Omaha employees are exemplary of the company’s intelligent, hardworking and committed staff. It’s those same three qualities that lead Sojern to recruit new employees from Hastings College. In October, Brummer and other Hastings College grads and Sojern employees met with a group of Hastings College students. For Brummer, the benefit of a Hastings College education shines through every day. He said the college provided him with a solid educational foundation and strong communication skills, which are vital in the Sojern workplace. His time as a student-athlete on the men’s soccer team showed him how to work as a team to achieve goals. But Brummer’s Hastings College experience gave him more than the degree and skills that equip him to be a leader at Sojern. In fact, Brummer ended up with the company thanks to the alumni connections he made through his alma mater. Brummer continues to embrace his Hastings College heritage today by hiring and mentoring Sojern staff members, just like Whitten did for him. And now with its new and improved space, the travel advertising giant that is Sojern is looking again to Hastings College in its recruiting efforts.